This week at GDC, virtual reality was on the forefront of everyone’s minds as SVVR and SFVR veterans took to the Expo floor and companies large and small began showcasing their forays into the VR and AR space. The promising demos of the week, though, weren’t limited to HTC and Valve with their Vive headset, despite many claims that it’s the ‘Oculus Killer’ we’ve all been waiting for – for me, the most impressive demo was Fove, a hardware headset that has managed to capture everything that we know about gaze-tracking input for virtual worlds in a sleek, Oculus-styled headset. 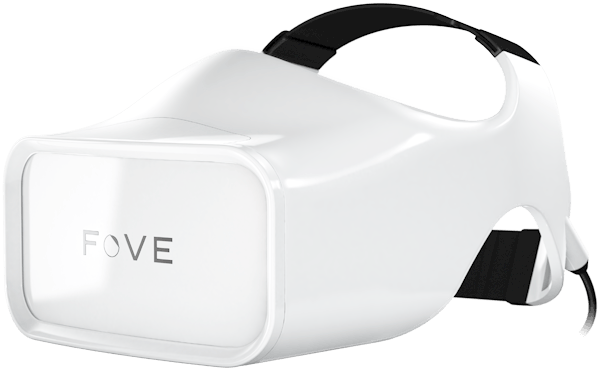 Fove, one of many virtual reality headsets that have emerged over the past several months, holds in own in what several tech news sites have declared an “over saturated” HMD market. Lochlainn Wilson, the CTO of Fove, showcased the device at an SVVR meetup back in January, and I had a chance to give it a try myself at the GDC VR Mixer this week. If you couldn’t already tell? It was probably one of the coolest things I’ve ever used. There is little that compares to the feeling of being straight out of an X-Men comic book like being able to shoot lasers out of your eyes, which is exactly what the Fove showcases in their short demo. The game, which follows a short calibration exercise where cameras placed around the headset lenses track your view of green dots placed around the screen, turns the player into a Cyclops-like superhero as you shoot down floating robots while under fire from them. While virtual reality technology never ceases to amaze me, this in particular struck me as being a game-changer in an ecosystem that is filling up rapidly with futuristic, sci-fi hardware and waiting on software to catch up. It seems like every week, a new company throws their own HMD into the mix, but Fove is already positioned to take on a leading spot in the race that is AR/VR tech. When I put the headset on, at first, it didn’t feel significantly different from a Gear VR or Oculus – although this one is a bit larger, the material that the Fove is made of is lighter weight, so the overall comfort was about the same. The calibration stage is quick and accurate – I blinked during one of mine, so the experience was off slightly, but I watched a few others go through the process and saw how accurate it was when calibrated properly (even with my blinking, I had an incredibly good experience playing the demo). During the SVVR demonstration, Wilson had showed off typing on a keyboard using the eye tracking input, and had been able to use the keyboard rendered on screen in front of him with perfect accuracy. This headset is just that good. Like most HMDs being announced, although there isn’t a set date for release, Fove announced at SVVR that there would be a Kickstarter coming up sometime in the mid-to-late spring of this year. Despite the supposed over-saturation of the HMD market, Fove is definitely one high up on the list of companies to watch, especially given the range of accessibility that a successful VR headset with concise eye-tracking enables. Adventures in Budapest @ JSConf!